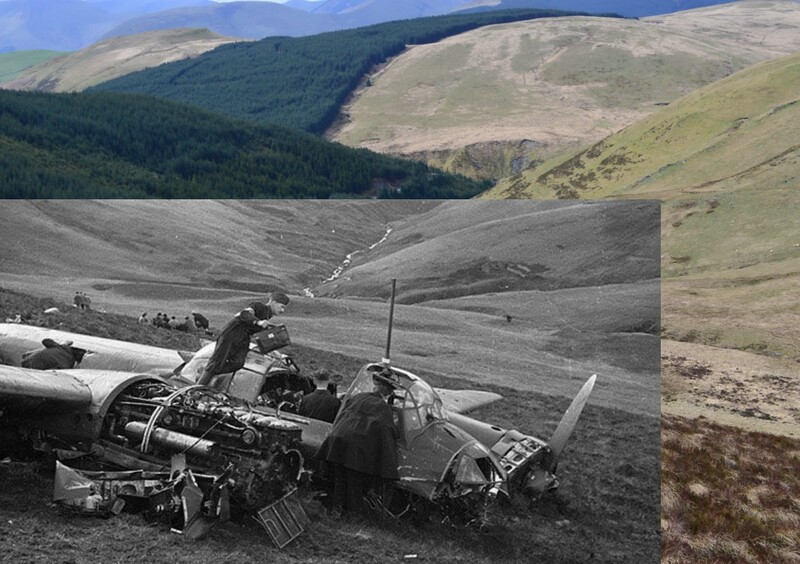 Various sources give the location of this crash site as being at Hafotyâ€™r Bwlch or Afon Clywedog but the location is approximately at grid reference SH 9235 1618. I can’t be sure I found the precise spot as trying to line up the photos as viewed on an iphone in bright sunlight wasnâ€™t easy. But someone with more time and printed copies might be able to nail the exact crash site and the above grid ref will be a good starting point. Junkers 88 4U + BL took off from Buc airfield, 13 miles south west of Paris on a photo reconnaissance mission over Liverpool. The crew had been undertaking such missions to Liverpool over the previous days. On this occasion however they were sighted at 20,000 feet over Hoylake by a Royal Observer Corps spotter who raised the alarm. Sergeant Lionel Sanderson Pilkington (aged 21, a native of Hull and already a veteran of the Battle of France) of 7 Operational Training Unit was in a MK IB Spitfire and instructing a pupil pilot when he heard the message about the enemy aircraft. He ordered the student pilot back to RAF Hawarden (which is just across the Welsh border near Chester) and climbed to find the Luftwaffe aircraft. Sgt Pilkington chased the Ju88 towards mid-Wales. 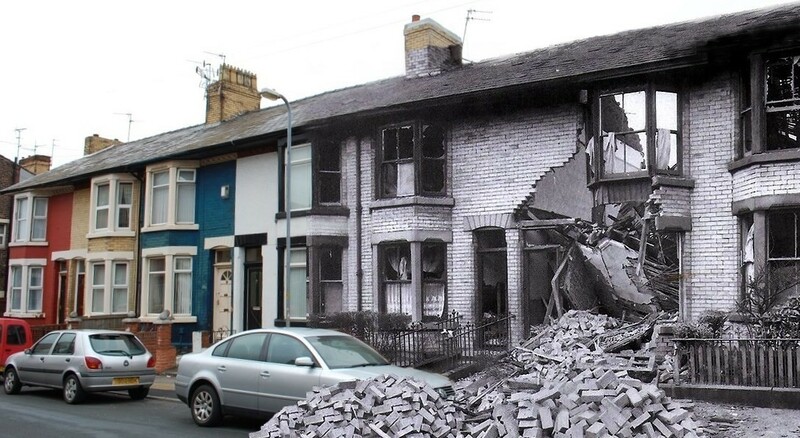 Below; Map showing Hoylake where the Ju88 was first spotted, and the crash site in Wales. Map from iTraveluk. Sgt Pilkington had opened fire from a range of 450 yards, closing to 100 yards. His shots hit the Ju88â€™s fuselage as well as the port engine. Fw Kobold returned fire, hitting the Spitfireâ€™s port wing. Sgt Pilkingtonâ€™s last view of the Luftwaffe aircraft was of it streaming smoke from the damaged engine as the aircraft dived for cloud cover at 5,000 feet. 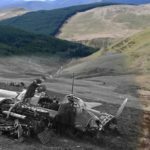 The starboard wing struck the top of a hill called Drum Ddu and the aircraft pancake crashed on the side of the hill, whereupon the pilot was knocked unconscious. Fortunately (and possibly because of the pilotâ€™s instruction to empty the fuel tanks) there was no fire. Even so, this was a rare event, the crews of aircraft which crash on high ground having descended through cloud rarely survive. Obltn Kauter, himself injured from the crash, as were all the crew, managed to inflate the emergency life raft and then helped his comrades from the wrecked Ju88 and into it. The crash happened at 1330. Obltn Kauter then began the arduous journey to raise the alarm. He followed the stream visible in the lead photo and by early evening he had made the four mile walk to the first sign of civilisation, the farmhouse at Gelli-ddolen whereupon he asked the occupants, Idwal and Jane Jones for help. Below; the now ruined farmhouse at Gelli-ddolen where Obltn Kauter called for help. Although injured, the crew were all treated at Machynlleth hospital and were later transferred to PoW camps in Canada. In 1985, Hans Kauter returned to the scene of his ordeal. 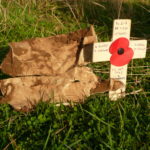 Sgt Pilkington however, did not survive the war. Just a year later on September 20 1941, and by then promoted to Flight Lieutenant, Lionel Pilkington was shot down and killed by Messerschmitt Bf109s over Hazebrouk, France. He had been due to marry his fiancÃ©e, Barbara Walker just 6 days hence. Below; the scene looking east. The most obvious changes are the Forestry Commission plantations and the absence of a German bomber on the side of the hill.